Oracle is embracing Docker – just like many other companies – as the de-facto standard in Container technologies. It has resulted in the certification of various Oracle products for running in Docker containers and even Oracle supported Docker images are available. Furthermore, Oracle offers 2 Cloud Service around containers: the Container Cloud Service is a generic service that offers a platform for running your containers. Next to that, Oracle offers the Application Container Cloud Service that is targeted to running Java SE, Node.JS, php and python applications. The Application Container Cloud Service is left out-of-scope. All cases describe the minimal steps to get a WebLogic container up and running: nothing fancy, very minimalistic, just to get you going. Some findings of the work done can be found at the bottom of this article. Even though this article is not intended as a Docker tutorial, below an overview of Docker concepts and terminology. That should be enough to get you moving if you’re new to this whole Docker containers thingies. A container image is a lightweight, stand-alone, executable package of a piece of software that includes everything needed to run it: code, runtime, system tools, system libraries, settings. A Docker container addresses the ‘runs-on-my-machine’ problem: it is a complete package that runs on any machine. In doing so, it also simplifies your CI/CD solution. The above diagram is best described as ‘where Virtualization offer OS isolation, Docker containers offer process isolation’. That does imply that Virtualization offers better security: the ‘isolution’ is at a lower level in the stack, thus making it less vulnerable. Swarm: a group of Docker hosts that run as a cluster. The Swarm consists of a number of Nodes and the Docker commands are handled by the Swarm Manager. In a cloud set-up, that choice is limited to what the cloud provider has pre-selected for you – the Microsoft Azure approach. Or, the offered Cloud interface may even hide from you the details about what management tooling is implemented: Oracle Container Cloud Service and Amazon EC2 Container Service. Of course, it is possible to only use the IAAS services from your Cloud provider and build up the whole Cloud Container platform yourself, similar to as if it were in your data center. For this blog series, that is out-of-scope. Before heading of quickly to your boss and promise that Docker containers will solve all of his application ‘packaging/deployment/CI/CD’ problems, please read this section. My interpretation: using Docker in a real-life situation is more complicated than it seems at first glance. 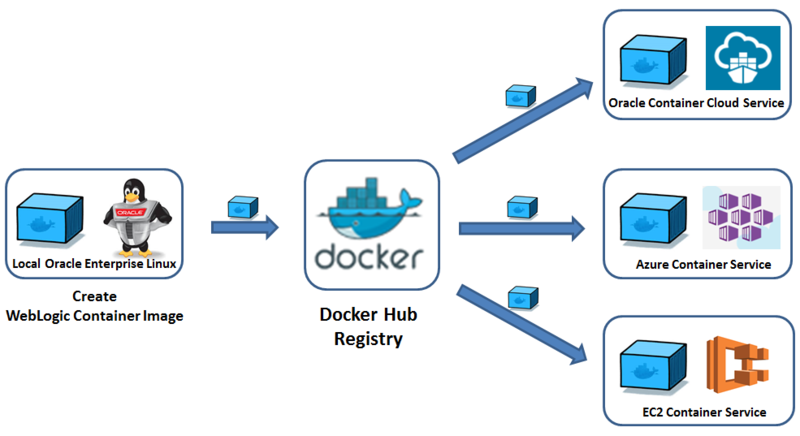 An application in a Docker container is rarely a completely isolated, stand-alone application. Normally, the application has configuration parameters that provide information on the environment that the application is running in. For example, host names, port numbers, DB urls, web service endpoints, user account names, etc. This environment specific information can be passed on to the container using environment variables. Both command-line and file-based entry is possible. Spinning up many containers also means that your networking has to be handled adequately: all traffic must be routed to the right container. 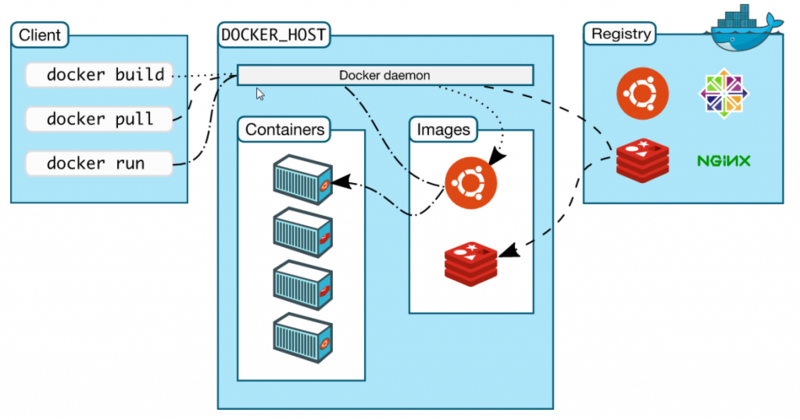 The topic of Docker container networking is far beyond the scope of this blog. Please refer to the official documentation to get a first understanding: https://docs.docker.com/engine/userguide/networking/. You still have to do that yourself: Docker only delivers on ‘process isolation’. Existing applications may have a high availability / clustering mechanism that doesn’t agree well with containers. For example, an active-passive set-up will not mix with scaling up through many containers. So, if you want to wrap your existing application into containers, you will have to consider this aspect. Existing applications may not fit nicely into a container. Separation of state and environment data from application logic may prove to be difficult. When development of a new application is started, it is easier to take this into account up front. However, it is possible to run a Linux container on windows. That solution is based on using the MobyLinuxVM on windows, and running a Linux container on top of that Linux VM. Furthermore, Kubernetes is working on a completely mixed Windows/Linux environment (https://www.mirantis.com/blog/linux-windows-living-together-total-chaos-ok-kubernetes-1-5/). Also note that the Windows containers implementation is currently (may 2017). E.g. Amazon claims (http://docs.aws.amazon.com/AmazonECS/latest/developerguide/ECS_Windows.html) that they still ‘consider it a beta that should not be used for production environments’. So, if you want to go into that direction, you should first investigate what the current status is! For the time being, just beware that mixing OS-es of host and container may be complex if not impossible. In the future, this I expect this all to be solved. The Amazon solution seems to me to be somewhere in between the Oracle and Microsoft approach. They have abstracted a couple of concepts like cluster, task and service into their UI, but a bit more advanced stuff has to be done using command-line on the EC2 agent machines. For development purposes, by application developers with relatively little knowledge of infrastructure stuff, I would recommend looking at the Oracle Container Cloud Service. Mainly because of the clear UI. For production purposes, I don’t have an opinion by now. The Microsoft solution has pro’s and con’s. The fact that it uses existing container management software gives you more work (bad) but also more flexibility (good) and if you run into issues, you may find more ‘google-based-support’ (good). I expect the that the Amazon solution will require some scripting and command-line stuff – which may sound bad, but which may also offer flexibility and fit well with the skills of the system administrators that will have to manage the cloud platform. The Oracle solution seems to strike a good balance between platform configurability and ‘easy-to-use’ UI. That seems to best fulfill the Cloud promise of ‘all-you-need-is-a-credit-card-and-a-browser’. Note that these findings cover 3 Cloud container offerings. It is not intended to be a complete overview of what is happening in the Docker container eco system. Other platform solutions, like for example Red Hat OpenShift, should also be taken into account when selecting a Docker container platform.